The CDC says opioid prescription levels are down since 2010, but there's a long way to go to end the opioid epidemic. There's some good news out of the Centers for Disease Control and Prevention: Opioid prescriptions fell for the first time since the epidemic began. Prescription opioids are used for pain relief and are considered safe when used for a short time, but they're also incredibly addictive. They bind to opioid receptors in the brain and other parts of the body to reduce pain. The amount of opioids prescribed hit its peak in 2010 and fell by 18 percent by 2015. The CDC only has numbers through 2015, so it's unclear if rates have risen since then. The data also showed that opioid prescription rates in 2015 were triple the 1999 rate. That means there's still a long way to go. Every year, tens of thousands of people in the U.S. die from opioid-related drug overdoses. An estimated 2 million Americans had an opioid addiction in 2015. People were also being prescribed the drugs for longer periods of time at higher dosages, giving patients more of a chance to become addicted. 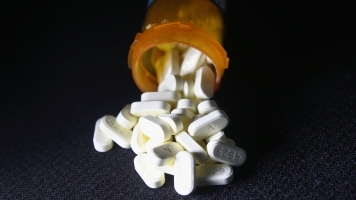 Opioids were once used to treat severe pain, post surgical pain and in end-of-life care. But eventually, the drugs began to be used to treat chronic pain and other ongoing conditions, which caused the number of prescriptions to increase. These put more people at risk for addiction and overdose. And when prescriptions end, some people move on to stronger illegal drugs. The death rates from heroin and fentanyl have increased a lot faster than death rates from prescription narcotics. The report is still a reason for some optimism — the new data suggests that at least some doctors have gotten the message to cut down on opioid prescriptions.